The ring is beautiful, and my fiance loves it! We would have preferred a more compact jewelry box, because she likes to keep it in her purse in case she needs to take the ring off. The engagement ring is absolutely gorgeous! My now fiancee absolutely LOVES, LOVES, LOVES her ring! The customer service reps, Dani and Christy, made my whole experience fun and enjoyable. They answered all my questions and delivered on all of their promises which were: a beautiful ring at an affordable price, an exact delivery date, and the utmost customer service. I would highly recommend Danforth to anyone and I plan on purchasing more of their gorgeous jewelry in the near future. My fiancee gets compliments on her engagement ring EVERY day by strangers she meets on the train or at work. If you saw the ring, you'd understand why. Thanks Danforth!!!! 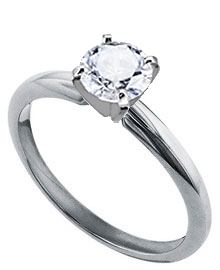 This classic palladium 3 mm heavyweight solitaire is suitable for any diamond shape or size. The four prongs snagged and ripped apart. I am not sure if it was the jeweler's fault when mounting the stone, but the rare ruby was lost. However, I am pleased with the palladium band the stone was placed upon.